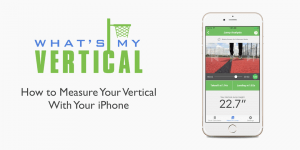 The Vertical Jump Analyzer web app only works on desktop computers. Forward to the take-off and mark it by clicking "Take-off"
Forward to the landing and mark it by pushing the button "Landing"
Load a video of the vertical jump you want to measure, preferably of good quality and high frame-rate. If you don't have a video at hand, you can click the button "Load example" below the video. If the video is not HTML5 compatible, it will not play. However, you can convert video to HTML5 on www.EasyHTML5Video.com. Press play and forward to the frame right before the jump where your feet still touch the ground. You can use the slider as well as forward /rewind buttons to find the correct point in time. In the example video, this is at 1.17s. 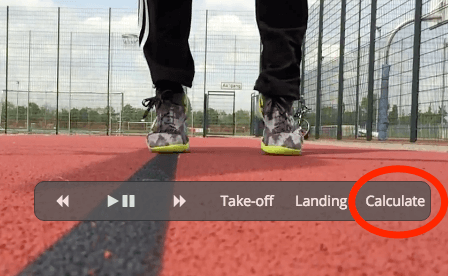 Press the button "Take-off" to tag the time in the video where the vertical Jump starts. Forward to the first frame where your feet touch the ground again. In the example video this is at 1.84s. Press the button "Landing" to tag the time in the video where the Jump ends. Now you just have to press the button "Calculate" to get your results. 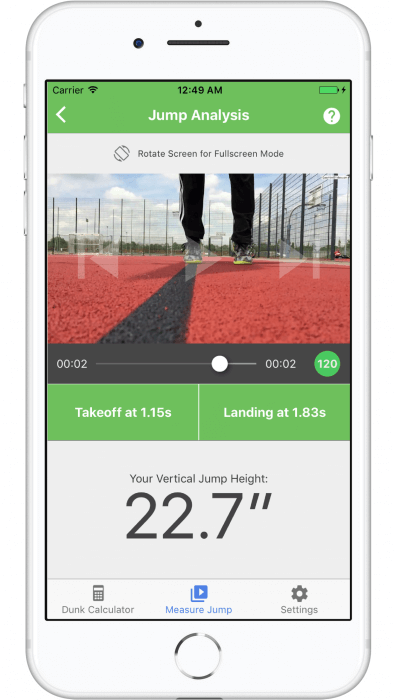 The vertical jump in the example video shows a Hang Time of 0.67s, which equals a vertical jump height of 55cm or 21.7 inches. Now, a graph will show you the plane of flight of your jump (1). When you click on any point of the blue line, the video jumps to the corresponding point of time. You can use this to check if you marked take-off and landing correctly. You can also see the height you need to touch the rim (green) or to dunk a basketball (orange). You can put in your own standing reach and rim height in the chart options on the right (2). 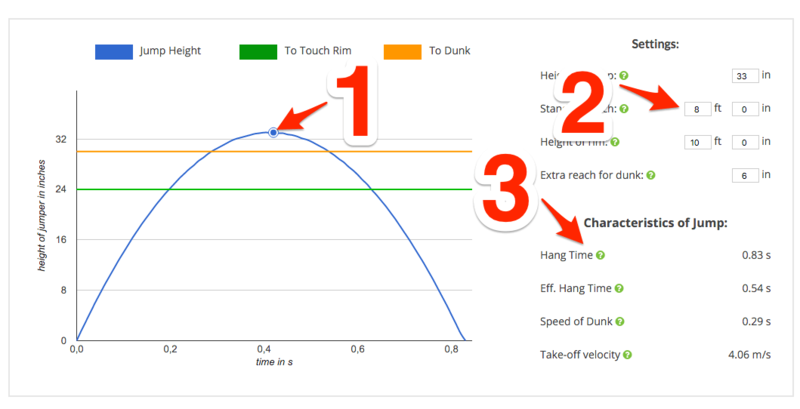 Different characteristics of the vertical jump are displayed below (3). from the comfort of your Iphone or IPad. 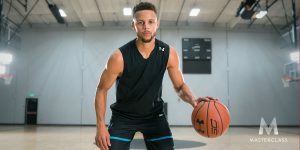 The analysis might overestimate your vertical jump if you land with bent knees or if you are hanging on the rim during a dunk. 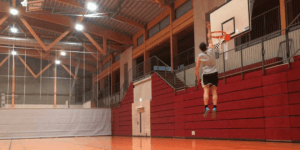 The analysis might underestimate your vertical jump if you take off and land on your toes. 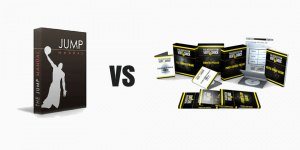 The analysis will overestimate your vertical jump if the video is in slow motion. The frame rate (amount of unique pictures per second) of the video should be as high as possible to ensure a precise measurement of hang time. In slow mode the Iphone 5s allows 120fps video, the Iphone 6 or laer models are even better suited with 240 fps. Another good camera for high-framerate videos is a Go Pro. You can check if you selected the take-off and landing correctly by clicking the peak of the jump in the displayed chart. If the video does not show the jumper at the highest point of the jump, you have to correct the point of time of takeoff or landing.